It’s that time of the year again: The time when you get to renew your global citizenship for another year. If listening to 91.1 The Globe (home of culturally progressive music) everyday at the Rott or reposting your pictures from SST over and over again on Instagram hasn’t made you feel like a global icon yet, coming to International Coffeehouse is surely going to get you close to it. And let’s be real, you need to take those pics and post them on Facebook to let your host family back in Peru know that you are still following your newfound love for diversity that you discovered during your trip to Machu Picchu. Also, how can you miss this event? All your favorite international friends are performing. If you fail to be there to support them, you fail GC because you need all your Core value points to graduate. And if you don’t come, I will make sure I snitch on each one of you to Becky so that you never get those points. And let’s be honest, Coffeehouse is THE best event of the year. It’s Goshen’s equivalent of “getting lit on weekend” and “diversity and chill.” Coffeehouse is like Kick-Off on steroids. It’s like if Coachella had a love child with Dancing with the Stars, only 100 times better. We have it all: musical performances by Sohail Das, our very own Indian John Mayer, Caleb Liechty, our favorite Menno Boy, Naomi Peters, our Canadian Whitney Houston and many more. Moves that kill by Phil and Nimoy, the best B-Boyers in the Midwest and their boy band, Deeksha Pagar, our very own Aishwarya Rai (if you don’t know who that is you are seriously in need of What is Beauty? class), Achieng Agutu, the Kenyan Princess and her fierce Wakandan army and obviously, the best, ME. Smiles and greetings will be coming your way from Aritha Weerasinghe, the exquisite Sri Lankan beauty and our very own daddy, Skip Barnett. And that’s not even a quarter of what we have in store for you. I’d pay one million dollars to see this show. You just have to pay $6 if you are a student and maybe $14 if you are not a student. That’s a great bargain. I promise you will feel like a global citizen when you walk out of Sauder. It’s the best party of the year. You’ll feel great and not at all like how you feel walking back to campus on weekends from off-campus “gatherings.” Comm-Mar and Admissions are going to heavily use the pics from Coffeehouse to promote Goshen College and its diversity, so if you come, you might be able to sneak into a few pics and feel popular as well. Good luck with that, though. So, please come. And if you have a good habit of reading the Record, we have hidden a few Coffeehouse tickets inside of some of them. 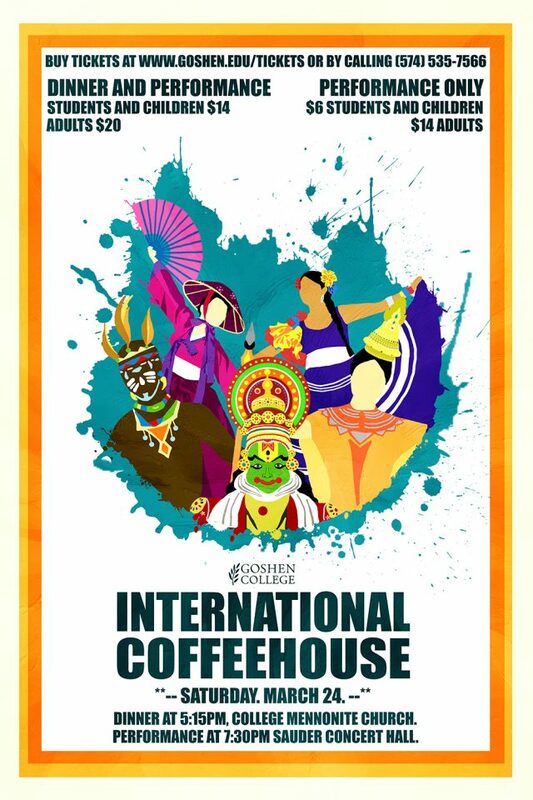 So, tell your friends, family and everyone else to come and support ISC and Coffeehouse. The fair part of the proceeds from ticket sales will go towards helping DACA students. So, be there for your friends. And mostly for yourself. It’s a night of entertainment.